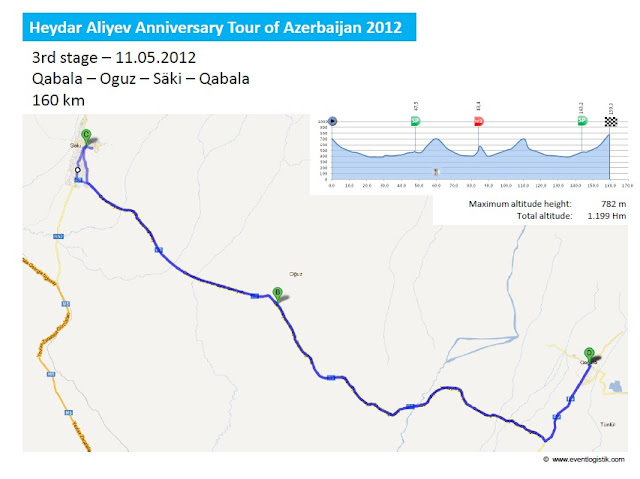 The younger cousin of that race from Iran that shan't be speaketh of in this thread, the inaugural edition Heydar Aliyev Anniversary Tour is a five day stage race which takes place around Baku and the foothills of the Greater Caucasus. 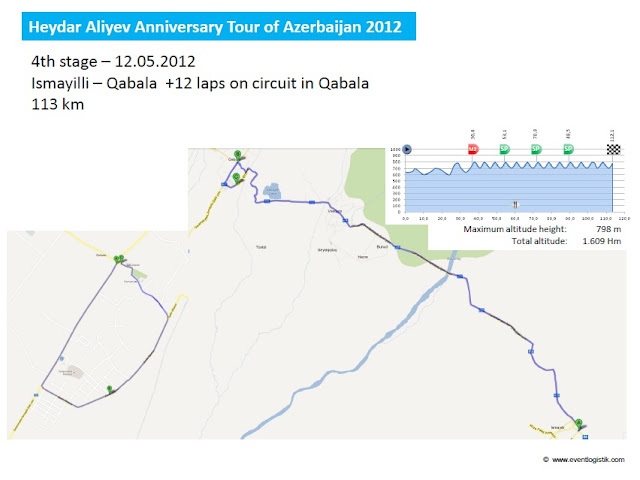 It will take place from the 9th to the 13th May and is the first professional cycling event in Azerbaijan. 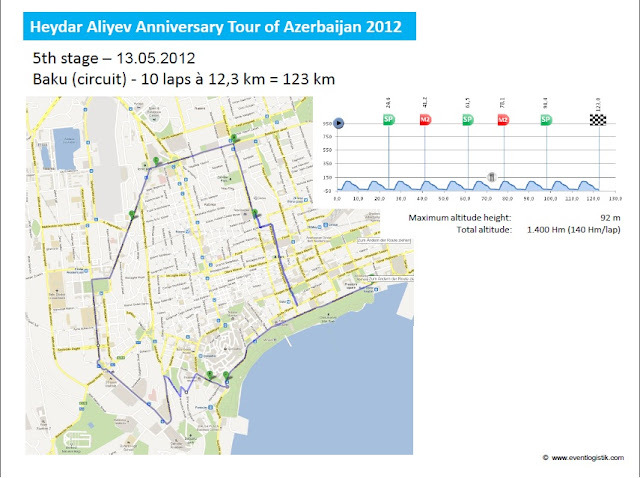 The Heydar Aliyev Anniversary Tour is for riders under 23 years and provide them to upraising their careers. The racing style is that continental teams from middle Europe pits against national teams from eastern Europe and middle Asia. Is that a speed bump they are going over on stage 4? no wonder the grown up race is in Iran. Yeah, still scouring out info about the race. Not too much around admittedly. Watch out for Fabian Schnaidt of Specialized concept store, he's got a decent sprint in him. Maybe Jono could reveal some info about the Aussie lot. 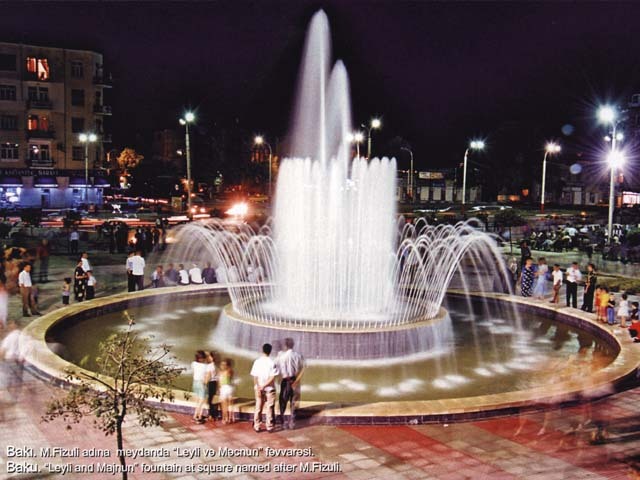 Tural Isgandarov. No, I'm not questioning what he's so excited by. 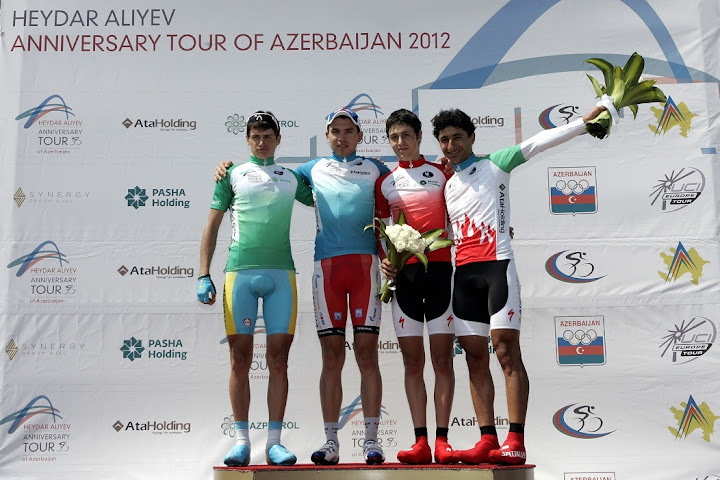 The Itera Katusha U23 (RUS) blazed to a 4-second victory in the team time trial to put Aleksandr Grigorev into the overall lead after the opening stage of the Heydar Aliyev Anniversary Tour of Azerbaijan (UCI 2.2). 18 teams started in the 30-kilometer race against the clock with the Itera Katusha U23 Team clocking a time of 36 minutes and 38 seconds. The Kazakhstan National Team finished second. Specialized Concept Store Team was third, 15 seconds slower. 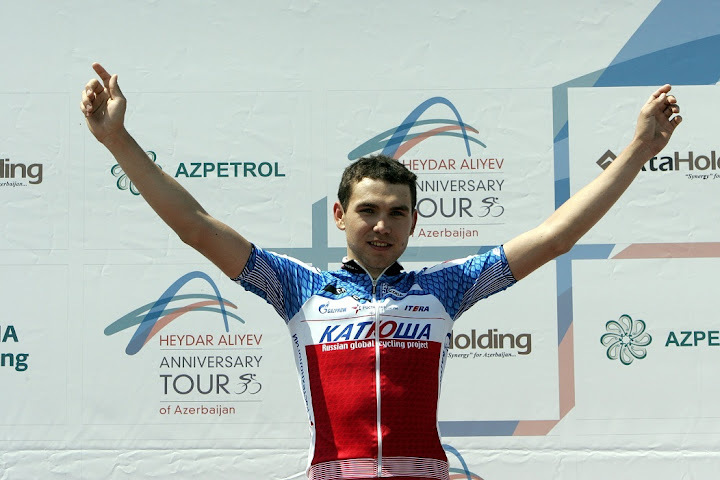 As the first rider from the Itera Katusha U23 Team to cross the line, Grigorev donned the blue jersey of race leader. "The whole team worked well together and we were really strong," Grigorev said. The 20 year-old all rounder, said he is realistic about his chances of keeping the lead in the five-day race that features one mountain-top finish. 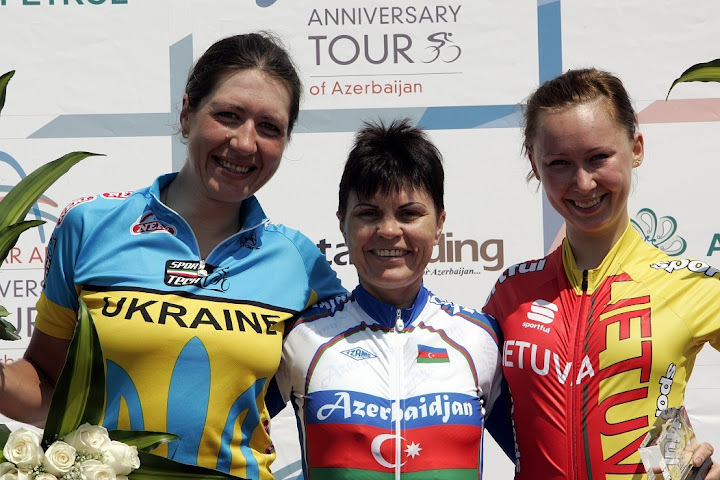 "The stages here are challenging and really difficult," Grigorev said. "But we will do everything to keep the jersey within the team." Itera Katusha's Sports Director and former pro Evgeny Popov said "we didn't see ourselves as the top favorite of today with so many strong teams, but we did it and I am proud of our boys. Anything is possible for the upcoming days, we have some riders who are able to fight for the end victory, we will see." What is attractive? Should I feel Isgandarov like attraction? Dolmans-Boels should win it for the women, bit dissapointed with Emma's time in the time trial though. Shes normally a pretty strong time triallist. Yeah, seemed crazy when I saw the list. It is the first time the race is being held, so that may well be a reason. Possibly have to add this in the intro. 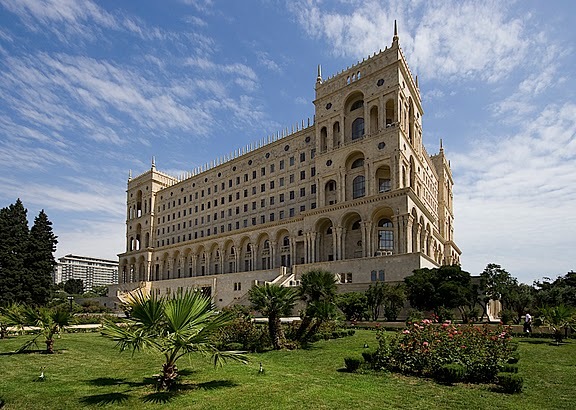 2 REGUIGUI, Youcef Centre Mond 12"
3 SAVICKAS, Zydrunas Gediminas 13"
4 DZHUS, Volodymyr ISD-Donetsk 01'13"
6 BUCHMANN, Emanuel SCS Specialized 01'21"
7 GAUGL, Florian Team Vorarl 01'21"
8 KOZHATAYEV, Baktiyar Kazakhstan 01'26"
9 YATSEVICH, Kirill Itera Katus 01'26"
10 KATYRIN, Roman Itera Katus 03'13"
The race was splintered all the way through, and there wasn't really a main group judging by the results, which are available here. 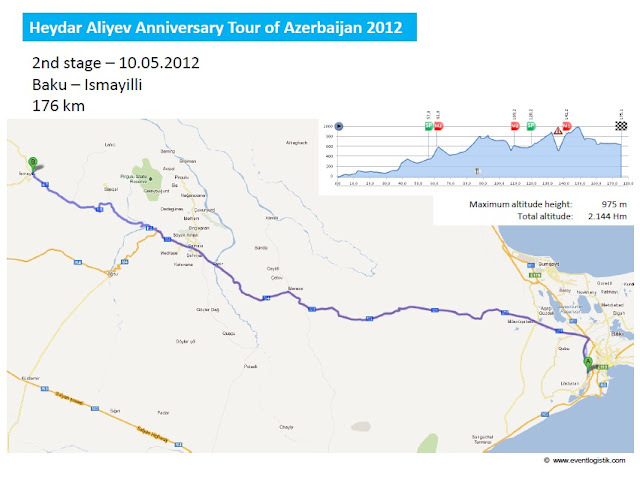 Today’s second stage of the Heydar Aliyev Anniversary Tour covered 176 kilometres from Baku to Ismayilli. Diego Rubio Hernandez (ESP), of Diputación de Àvila - Smilekers.com, won the stage, and Youcef Reguigui (ALG), riding for the Centre Mondial du Cyclisme, took the lead in the general classification. With many riders trying to escape right from the start, the race broke up early today. After 20 kilometres the peloton split into two groups, and the first of them, with 28 riders, rapidly built up a lead of around two minutes. Several riders tried to attack out of the front group, and after the first mountain sprint four managed to escape. The break grew to six riders and built up a gap of more than a minute. After about 90 kilometres of racing, the second group, led by Diputación de Àvila - Smilekers.com (a team run by 2008 Tour de France winner Carlos Sastre), chased down the group ahead and then reeled in the six-man break as well. Just after the second intermediate sprint, five riders attacked, but only one managed to stay away, Zydrunas Savickas (LTU - Gediminas Gruodis). He was joined by group of 8 riders on the final climb. 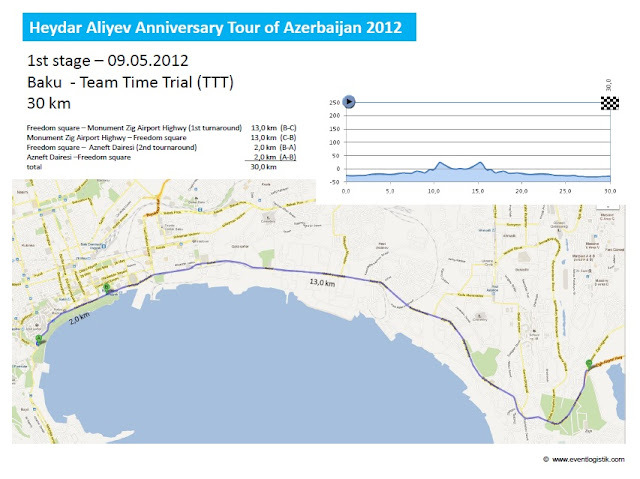 In the difficult run-in to Ismayilli, three riders attacked out of the nine: Rubio, Reguigui and Savickas. In the last kilometre, Rubio managed to escape from his companions and crossed the finish line solo, 12 seconds ahead of Reguigui, who took over the lead from Aleksandr Grigorev (RUS). "Big day for the boys yesterday. They wee very tired at dinner time. Still managed a few laughs.nick was 5th and dave12th. Mitch rode like he was going to steal it in the first half but the climbs were taking their toll on everyone. It was clear it was going to be a last man standing event. Another big day today. We are confident we can get a podium here go home." A bit of a dodgy question Jono, is there, or how much of, a prevalence of age fraud is there in such races? Certainly happens here in India in domestic under age events. Nick Dougall rides for Eclipse cycling team i think. Yep, he dose ride for them. I don't either but I'd like her number. That could be an effeminate male with a pony tail, you never know. Never judge a book by the back cover, the front cover is okay, and reading it is too long winded. What does the colour of hair under the lid say? THat's an easily distinguishable feature for the two.